Happy Father's Day to all of the Dad's out there and to all of the Moms who are doing the jobs of both Mom and Dad. I hope you all have a day filled with lots of love, laughter and happiness! Instructions: Cut 6” x 6” black card base. Cut designer paper 5 ¾” x 5 ¾”, ink the edges with Black Soot Distress ink and adhere to the card base using dimensional tape. Cut border from the Ornate Borders and Pockets Die and cut the 3 ¾” x 4 ¾” black panel using Cut Mat Create 2A Die. Glue the border to the panel and adhere to the designer paper using dimensional tape. Cut the decorative die from the Everyday Heroes Die Set from Metallic cardstock and adhere to black panel using dimensions. 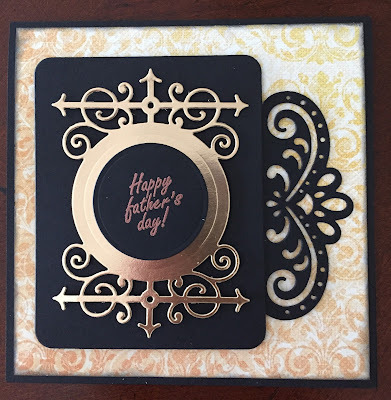 Using VersaMark, stamp the sentiment on black cardstock and emboss using Range Copper Embossing Powder. Cut out the sentiment using the circle die and adhere to the center of the decorative die using Dries Clear Glue. Cut a 5 ½ x 5 ½ piece of white cardstock add to the inside of the card.